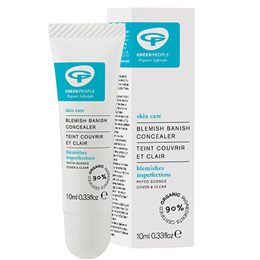 Green People Blemish Banish Concealer is a multi-purpose, 90% organic anti-blemish cream to cover and clear spots. Green People Blemish Banish Concealer is an anti-bacterial formula to conceal and mend, it not only covers blemishes, it banishes them too! A unique blend of natural goodness with Green Tea, Tea Tree, Zinc oxide, Rosehip and Vitamin E that fights spots, normalises sebum production, and also reduces redness and irritation! With added Pineapple enzymes and Bentonite to unblock pores and draw out impurities. A make-up bag must have! Aqua (Spring Water), Helianthus Annuus (Sunflower) Seed Oil*, Titanium Dioxide (Mineral Pigment), Cannabis Sativa (Hemp) Seed Oil*, Rosa Moschata (Rosehip) Seed Oil*, Cera Alba (Beeswax)*, Coco Glucoside (Plant Derived), Coconut Alcohol (From Coconut), Arachidyl Alcohol (Plant Derived), Behenyl Alcohol (Plant Derived), Arachidyl Glucoside (Plant Derived), Bentonite (Natural Clay Mineral), Zinc Oxide (Mineral Pigment), Aloe Barbadensis (Aloe Vera) Leaf Juice Powder*, Tocopherol (Vitamin E), Xanthan Gum (Corn Starch Gum), Camellia Sinensis (Green Tea) Leaf Extract*, Chamomilla Recutita (Chamomile) Flower Extract*, Hamamelis Virginiana (Witch Hazel) Water*, Aroma [Citrus Aurantium Dulcis (Sweet Orange) Peel Oil*, Lavandula Angustifolia (Lavender) Herb Oil*^, Vanilla Planifolia (Vanilla) Fruit Extract*^], Ananas Sativus (Pineapple) Fruit Extract, Melaleuca Alternifolia (Tea Tree) Leaf Extract, Benzyl Alcohol, Salicylic Acid, Sorbic Acid, Glycerin, Ci 77491, Ci 77499, Ci 77492 (Iron Oxides), Geraniol*, Limonene*, Linalool*. For spot treatment and cover, dot gently onto the affected area. For foundation cover, mix as desired with your moisturiser. Below are reviews of Green People Blemish Banish Concealer - 10ml by bodykind customers. If you have tried this product we'd love to hear what you think so please leave a review.